Our website has been changed. Please visit www.thinkleaf.ca to subscribe for updates. Education is the foundation of lifelong learning. Our goal is to show children the endless possibilities of the digital age and empower them to convert their thoughts in to a reality. Think leaf's philosophy is IDEAL, where kids Imagine, Design, Evolve, Achieve and keep on Learning to unleash their little engineering minds using NASA Robotics Alliance Projects, electronic devices and other leading education tools and current technologies.Think Leaf Engineers, designed the programs, to ignite the kids minds to Imagine, enhance students engagement in Design, Evolve using critical thinking and problem solving skills, Achieve as a team and connect to the real world through continuous Learning. STEM is an acronym for Science, Technology, Engineering and Math. According to the United States National Research Council, National Science Foundation, STEM fields are collectively considered core technological underpinnings of an advanced society.Scouts Canada has taken similar measures as their American counterpart to promote STEM fields to youth. Their STEM program is currently in the pilot stage, scheduled to launch in 2015.The term STEM is increasingly used in the context of a nation’s economic competitiveness. Here in Think Leaf Learning we incorporate art along with science, Technology, engineering and math. 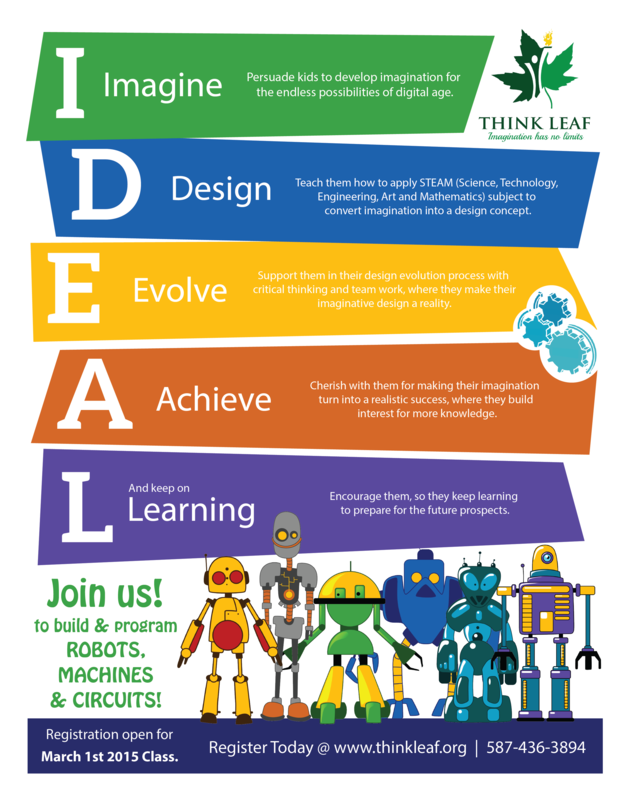 @Think Leaf: imagination + STEAM subjects = iSTEAM. Please join us to Learn and Lead in Digital Age. Calgary, AB - T3H 0A5, Canada.